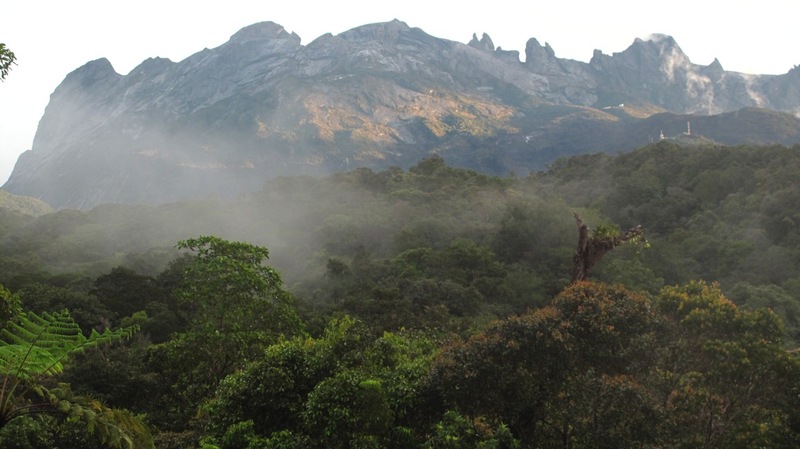 Last week me, my brother and 3 other friends went to Kinabalu Park, with ambitions to scale the peak of Mount Kinabalu. It’s 4095 meters high (13,435 ft). 20th in the world (in terms of peaks by prominence). 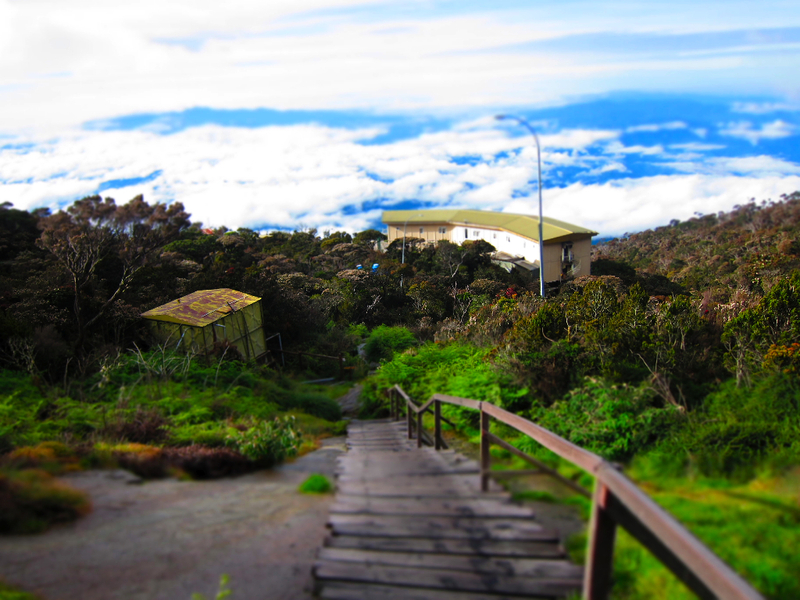 I first attempted to hike up Mount Kinabalu back in October 2010, but failed at Laban Rata, which is at 10,734 feet. I was affected by acute mountain sickness (AMS, also known as altitude sickness) and that essentially was the end of my trip. I didn’t do my research thoroughly and at the time I was hit by altitude sickness, I didn’t even know it was that! I thought it was some sort of severe headache or fever! According to online guides, one of the ways to prevent altitude sickness is by having extreme fitness (yup, that’s right, extreme) or by getting Diamox. I’ll write a separate article on Diamox later. I figured I’ll never get anywhere near extreme in terms of fitness, but I guess improving mine by a lot would definitely help. Some people get altitude sickness, and some don’t. You might be as fit as a marathon runner and still be affected by altitude sickness (to a certain level). It’s a genetic thing. Everybody’s different. But by having a high level of fitness, you can somehow reduce its affect to a tolerable level. The key takeaway from my failed attempt was that the mountain is a harsh place. Only people that have attempted high altitude hiking would understand what it really takes to scale mountains. It does not discriminate against men or women, the young or the old. That is the key thing that you must understand when dealing with high altitude hiking. My training involved lots of running on different gradient level. For 4 months, I ran around 2-3 sessions a week, in which each session would be 6KM long and I’ll be running up and down the hills in my neighbourhood. I would constantly push myself to ensure I’ve maxed out my energy and stamina in each session. To be honest there are certain sessions that I end up throwing up after running due to overexerting myself. So, after some serious training, I headed back to Kota Kinabalu on 22 January 2011. 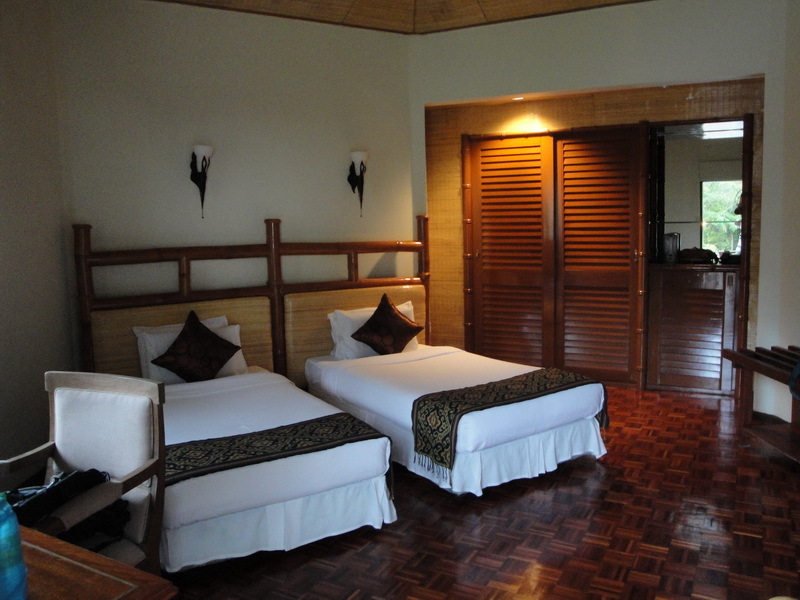 I used the same travel guide, MatthewPaul Travel and Tours (email: matthewpaultravel@gmail.com). 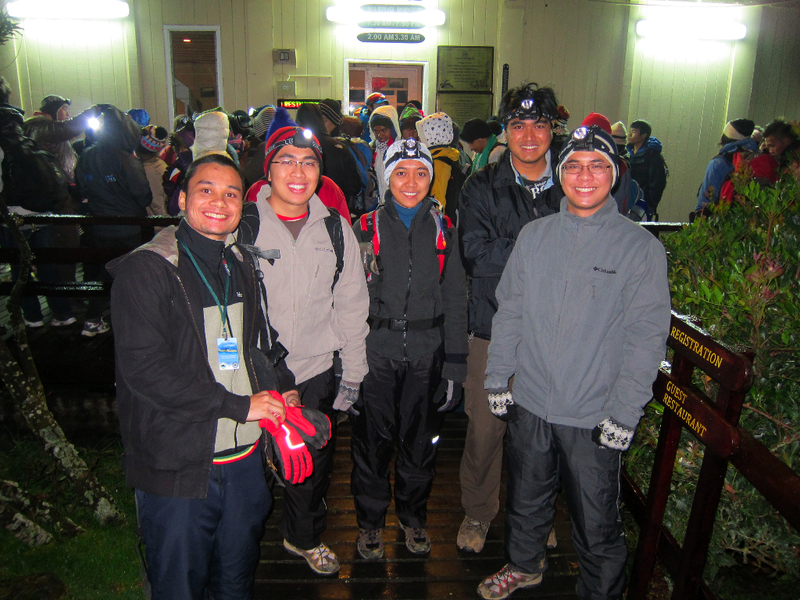 We arrived at Kinabalu Park around 4PM. We checked-in into our park accommodations. We were all excited with the chill weather. 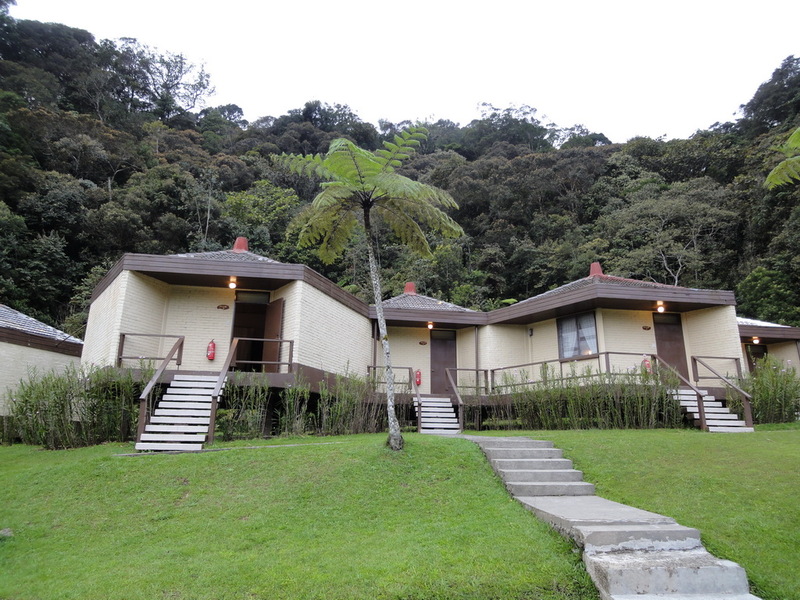 Meals are provided at Balsam Restaurant, which is near Kinabalu Park’s HQ. The restaurant is a 10-15 minutes walk from our rooms, but with the chilly weather and the rich view of the forest around us, we really enjoyed walking along the path and inhaling the fresh cold air around us. 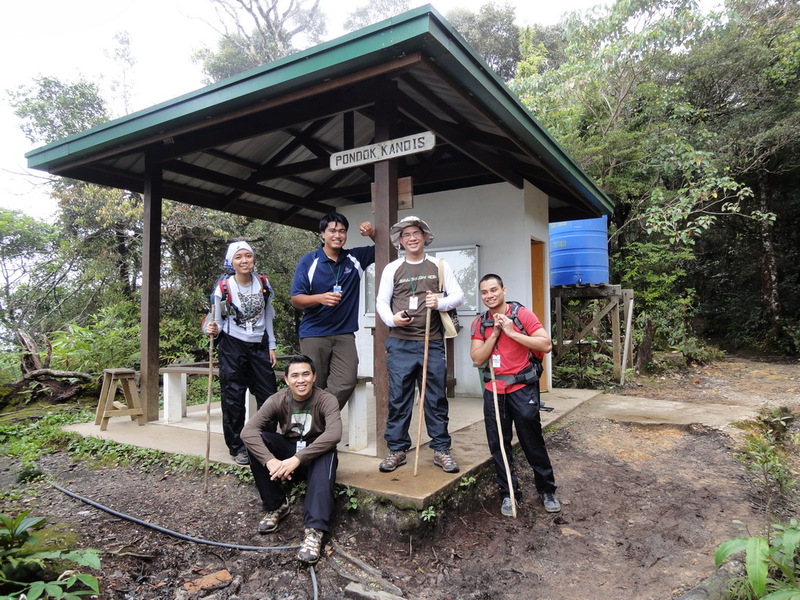 The next morning, after breakfast, we were introduced to our mountain guide at Kinabalu Park. His name is Jaldi Jaidi (far left in the photo above). He’s very experienced and has a sense of humour, which is always a plus. Before we started hiking, he explained the route to us and warned us about the change in altitude and how that would lead to altitude sickness. Note: From this point onwards, whenever I mention a location/building, there’ll be a distance unit beside it. E.g. location_example (x.x KM, xxxx m ASL). 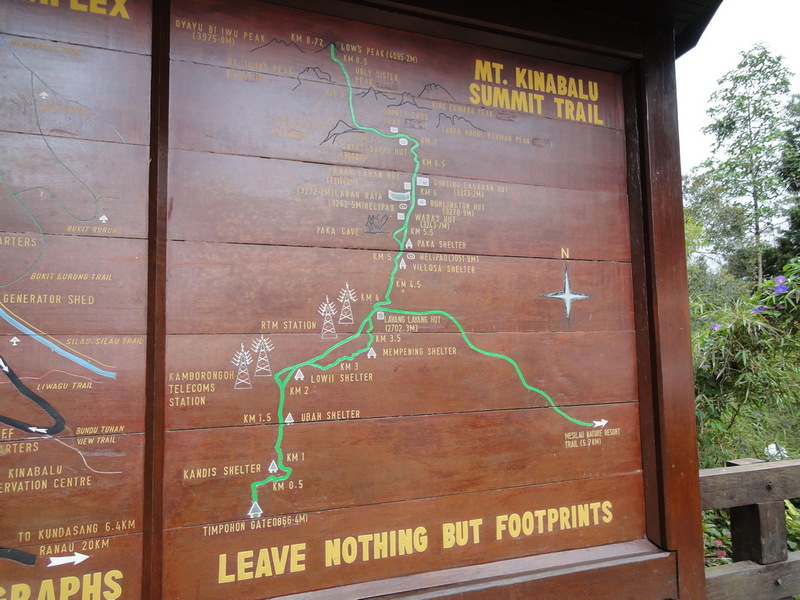 The KM would indicate trekking distance (on foot), and the ASL would represent “above sea level” vertical height. 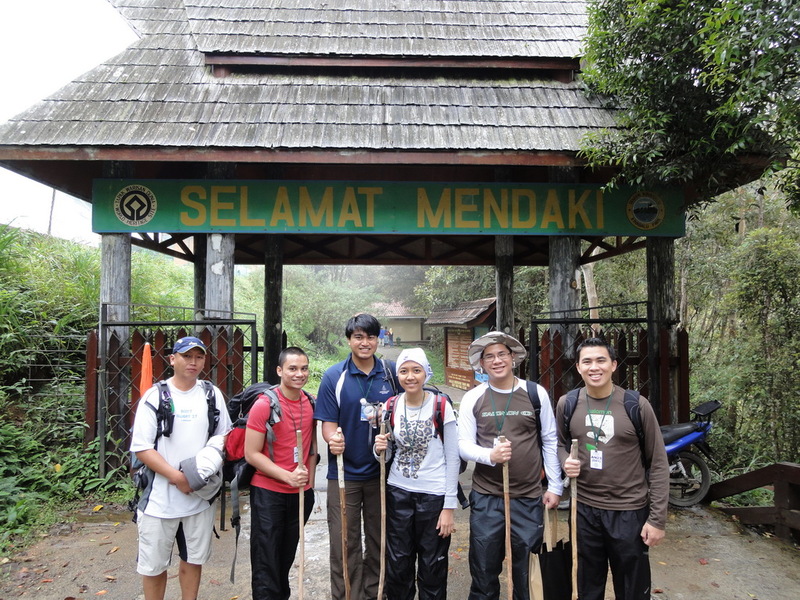 We started our hike up from Timpohon Gate (0KM, 1866 m ASL) at 9:30AM. 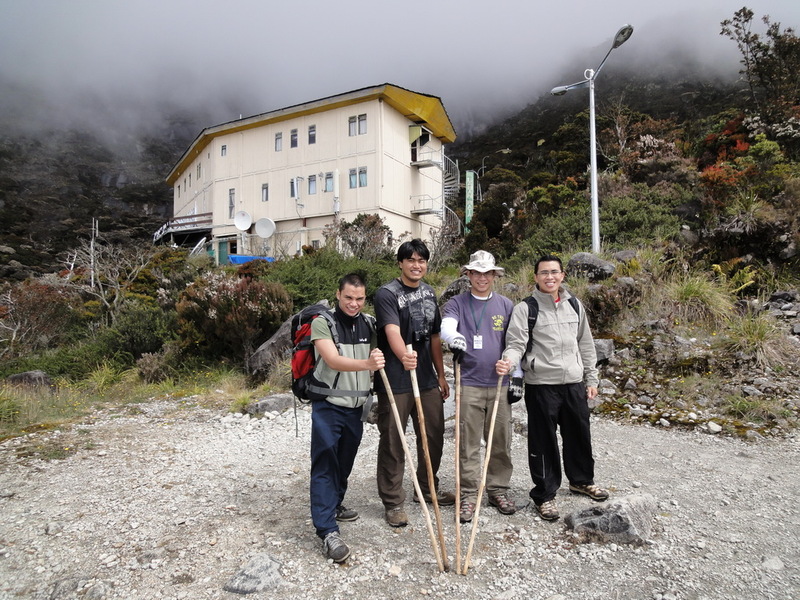 Our destination was Laban Rata (KM6, 3272 m ASL) where we will rest for a few hours before continuing to the peak. 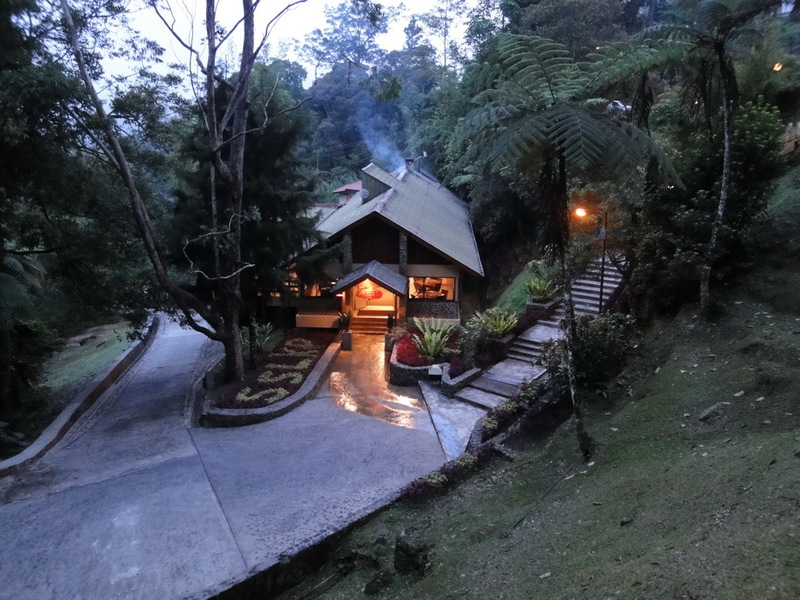 The total hiking distance to the peak is 8.7KM, and Laban Rata is kat KM6. 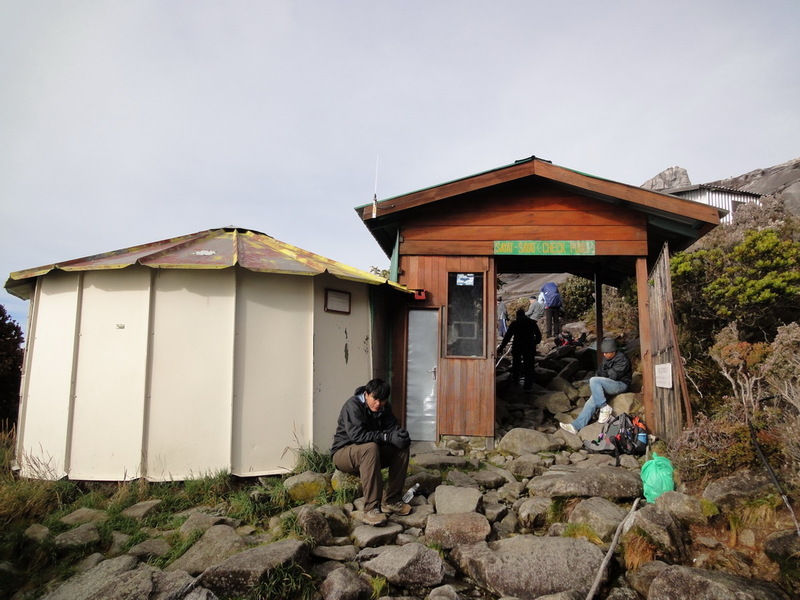 There is a rest hut roughly every 1KM (photo below) which provides toilet facilities and drinking water (untreated, it’s fresh from the mountain). It rained along the way and we had to pull out our ponchos. We took a break at Layang-Layang Rest Hut (at KM4, 2700 meters ASL) and had lunch there (the park had prepared a lunch pack for us). 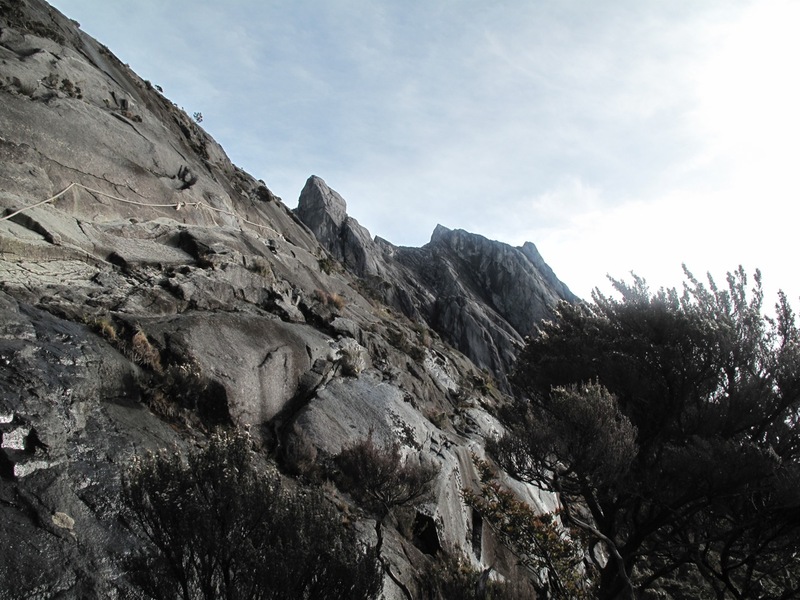 Hiking up Mount Kinabalu is about climbing thousands of steps, in which a large part are stones put together to form a path upwards. The air got thinner from Layang-Layang onwards and the guys that were not prepared for this had difficulty breathing. This is also the same altitude where you would get affected by altitude sickness. The guide has instructed us to breathe heavily from our mouth and to maintain our pace. That really helped in ensuring our bodies have enough oxygen to adapt to the changing altitude. Not that I’m bragging or anything, but due to my intense physical preparation, I was able to get to Laban Rata without feeling totally exhausted (by comparison, back in October I could barely walk after reaching Layang-Layang!). 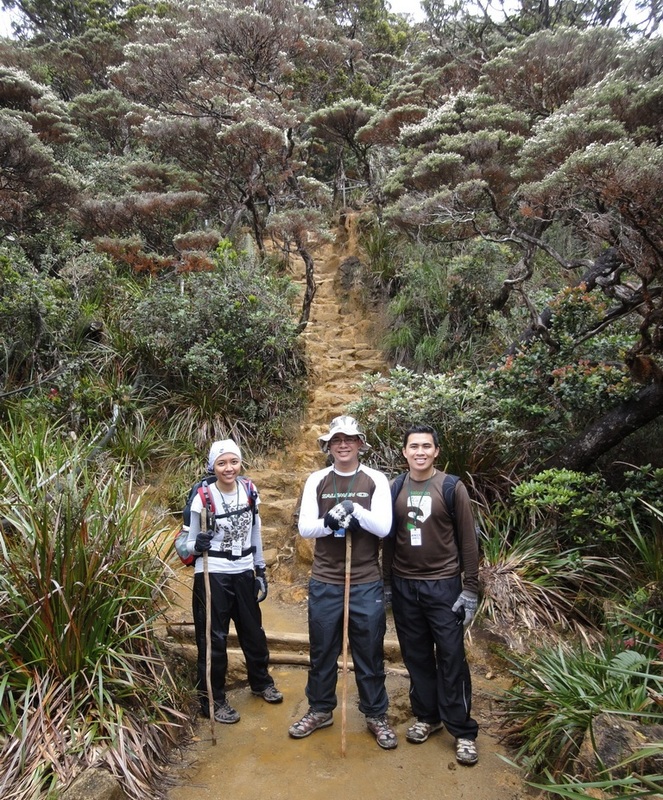 We reached Laban Rata (KM6, 3272 m ASL) around 3:30PM (photo below). We checked-in into our dorms and later had dinner at 6PM. They prepared a nice buffet and it really feels satisfying having all that hot steamy white rice in that cold weather. Laban Rata is around 7 degrees Celcius. After dinner, all of us went to bed to ensure we have enough energy for our ascent later on. We woke up around 1:30AM and had supper at the cafeteria at 2AM. We dressed heavily as we’ve been told that this time around the wind is really strong and we’ll be experiencing very cold weather. The temperature should be around 2-4 degrees at the peak. I had 2 layers of pants on (1 on top the other), 2 long sleeve t-shirts and a waterproof jacket. We ensured all our headlamps are working before moving on (photo below). There was a bit of forest hiking between Laban Rata for about 600 meters. After that, we encountered the “danger zone”, where we need to climb around the wall with a steep cliff. The “danger zone” lasted for about 250 meters. Bear in mind that all this is done during pitch black with the only lights around us were our headlamps. I’ve provided a daytime photo of the “danger zone” below. After the “danger zone”, we arrived at Sayat-Sayat Hut (KM7, 3668 m ASL). It is the last checkpoint before heading to the peak. A park officer was there to check our passes. It was around 4:15AM and it was really dark. We refilled our bottles with the free flowing mountain water, and we continued our ascent. A daytime photo of Sayat-Sayat is provided below. From Sayat-Sayat onwards there were almost no more trees. We were completely exposed to the strong mountain winds blowing around 40-60 kmph. The temperature dropped and we can really feel the difference. Due to the heavy mist, from Sayat-Sayat onwards we continued our journey by following the white rope on the floor. The white rope was available from the “danger zone” through Sayat-Sayat and all the way to the peak. My mistake was that I brought cotton gloves. Certain parts of the rope was wet, and the water went through my gloves. My fingers almost went numb from the freezing water! Make sure you bring a thick waterproof glove (the ones used for skiing is perfect). From KM8 onwards, the strong wind coupled with the low temperature resulted in my lips being numbed. It was quite funny how my friends couldn’t understand what I was saying (at this point I wished I had bought the ‘wind mask’ that were sold at Kinabalu Park). In the photo below, which is at the top of mount Kinabalu (near the peak, around KM8.5) you can see the low visibility that we had during sunrise. Sunrise was blocked by heavy mist and we didn’t get a clear view of the sun. We reached the peak around 5:30AM. After all that struggle battling altitude sickness, harsh winds, cold temperatures and long strenuous trekking, we have reached Low’s Peak (KM8.7, 4095 m ASL). It was the most satisfying feeling I’ve felt in a long time. Low’s Peak is named after Hugh Low who did the first ascent in 1858. We stayed at the peak for around 10-15 minutes. We would love to stay longer, but with the temperature being around 2 degrees, we had to descent to lower altitude. As the sun was up during our descent, we have a fantastic view of the mountain top and its surroundings. I saw some of the groups arriving at the peak before sunrise and then rushed down even before the sun was really up. It’s a pity they didn’t stay for the majestic view which is only available at 13,435 feet. We took lots of pictures on our way down back to Laban Rata. We arrived at Laban Rata around 9:45AM. 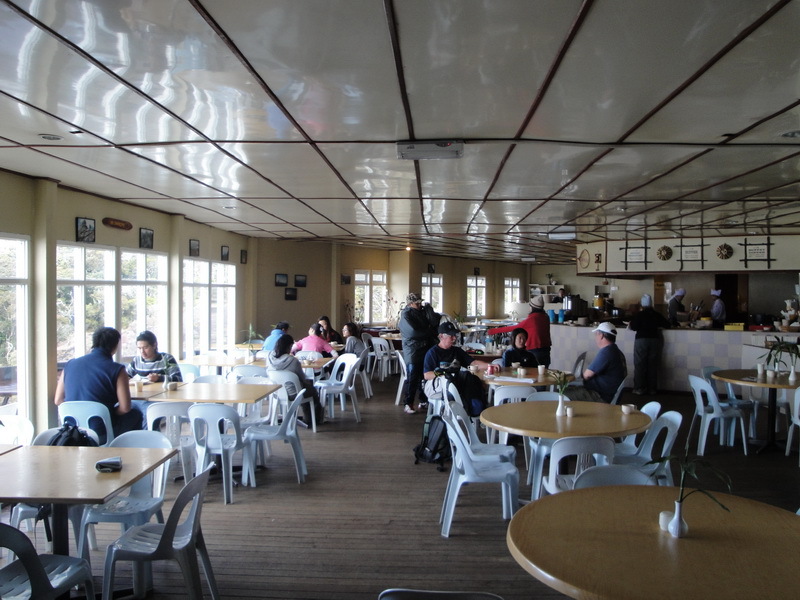 We had breakfast and we started our descent from Laban Rata downwards around 11AM. Our walking sticks really helped a lot during our descent as most of the guys could feel their knees aching.You see, when hiking up, there’s not much strain being put on your knees as you’re using your thigh and hip muscles. But the thing about going down is that, all your weight (including your backpack) is being put on your knees. I highly recommend you getting the walking stick before starting your hike, it’s only RM3. All of us had muscle sores for at least 3-4 days after the hike. There are a few ways you can cure these muscle sores. First is by doing a short jog (less than 1 KM) after resting for a few hours, this will act as a “warming down” for your legs, or you could just go for a few massages. The mountain guide highly recommended the “warming down” jog, but I believe most of us went for the leg massage. All in all, it was a great adventure. As a Malaysian, I am extremely grateful to have such an amazing natural wonder in my country. This adventure has sparked an interest among my friends to seek more outdoor adventures. 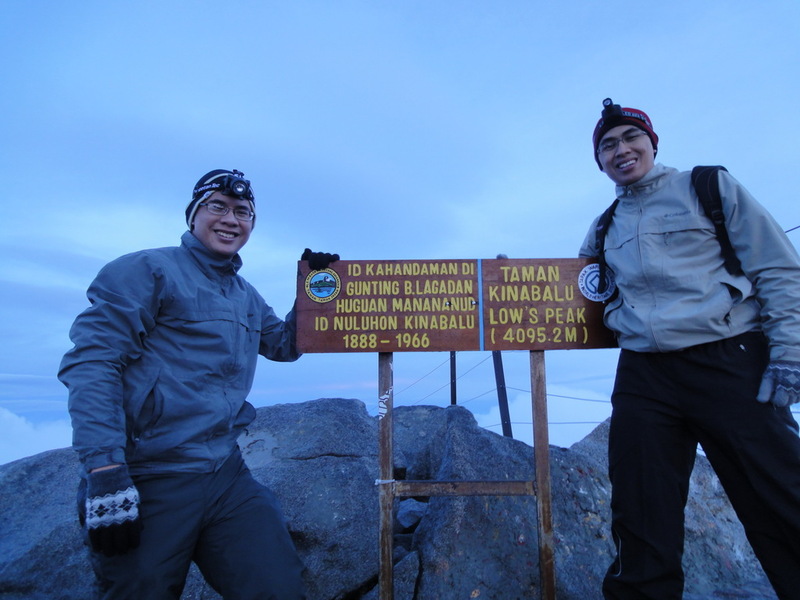 We hope to conquer Mount Tahan (2187 m ASL), the tallest peak in the Malayan Peninsula and perhaps, in the near future, Kilimanjaro (5895 m ASL), the roof of Africa! 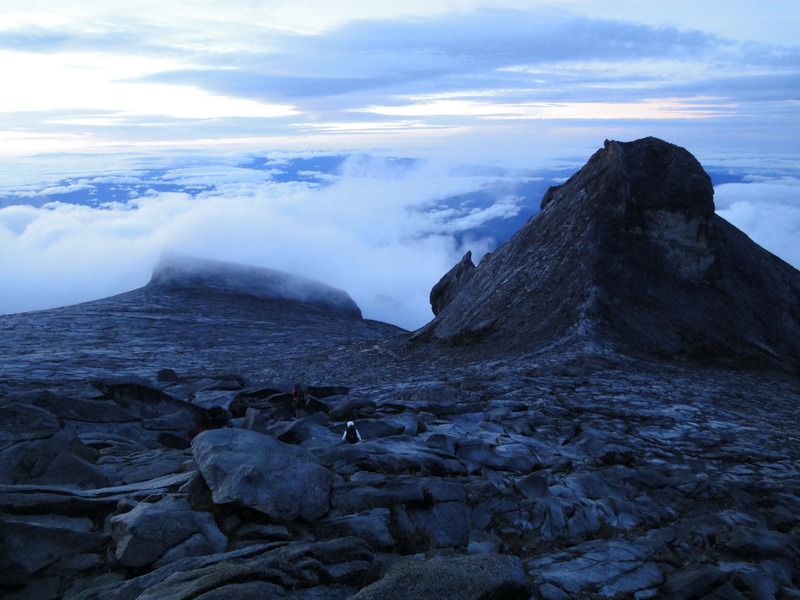 Photos: Our Mount Kinabalu photos are available here. alright bro!.. my turn nexxt!.. awesome! Great write up from any other post that i have been looking thru. Thanks mate. I am going up wt a few friends very soon.